Rathlin Island lives in myth within my family, which is why the events of this morning were so magical. Somewhere between his birth in 1811 and his death in South Boston on October 28th, 1880, Archibald Black left Rathlin for America. He was my great great grandfather. Thanks to a pilgrimage by my Granduncle, Brother Jason C.S.X., and my Uncle Eddie Black in the late sixties that traced my family history back to the island, we’ve learned quite a bit about the place. It’s enshrined in their classic report called The Blacks of Ballygill. You can see Rathin’s boomerang shape in the map above, off the north coast of Ireland. That’s Scotland to the right. 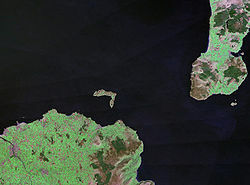 In addition to being the point of origin for the Black family, Rathlin Island was the scene of some other significant historical events. It has been populated since 2500 BC, when it had a thriving export trade in stone axes, presumably for use in ways other than chopping down trees. In 200 BC, the King of Norway tried to kidnap Princess Taise of Rathlin. It’s first Viking raid occurred in 795 AD. 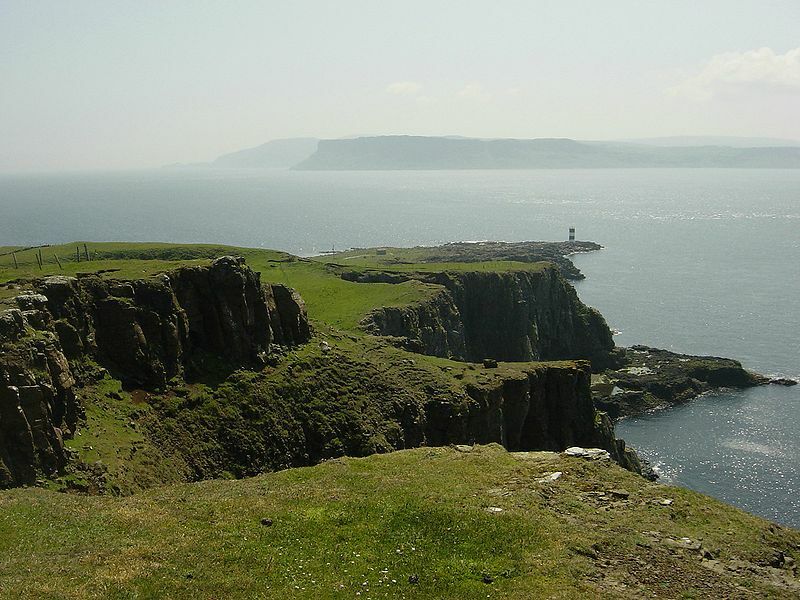 The famed Robert the Bruce took refuge in Rathlin in 1305. A number of massacres occurred in the 1500’s, perpetrated by the Scottish Campbell Clan. In 1617, Sir Randal McDonnell won a lawsuit that established Rathlin as Irish and not Scottish, after which the massacres resumed. Modernity visited Rathlin when Marconi himself established a radio link to Rathlin in 1898. The year 1955 saw the first car on Rathlin and there are precious few to this day. But all of that pales against the place it holds in my family. Because it is so remote, hardly on the typical Irish tourist itinerary, nobody has been there since Brother Jason’s visit. It’s like Atlantis. We’re not even sure it really exists. Even Google Maps hardly takes note. As you zoom in, it shows up much blurrier that the surrounding geography. Me: So, where are you right now? Danny: I’m on a cliff overlooking the Atlantic or some big body of water. Danny: It’s really beautiful. Went swimming this morning. It was bitter cold. Also, I can see Scotland from here. Me: Really? What town are you in? Me: Hmm. 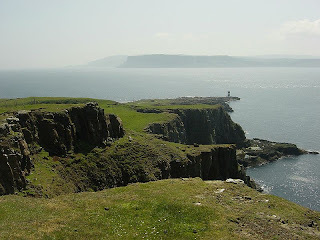 If you’re looking over to Scotland, you must be near Rathlin Island, our ancestral home. Is there an island in sight? Danny: Yes, there’s a small island to the left. Me: Oh my God! That must be Rathlin! A quick check of Google Maps supported the fact that Danny was looking at Rathlin. A text came a bit later in which he confirmed it, having asked a local. I have to say I was almost moved to tears. It was like the family coming full circle, from Archibald to Danny. It was bittersweet, however, in that the people I most wanted to share this moment with, my father and mother, are both gone, my mother only a little more than a year ago. So, instead, I get to share it with the whole world, or at least that infinitesimal part of the world that reads this blog. I did call my sister and she understood the magnitude of the moment. The rest of our immediate family is booked to visit Danny over Thanksgiving week. Our key destination is now established. Enjoy, it's the most beatiful place on earth!